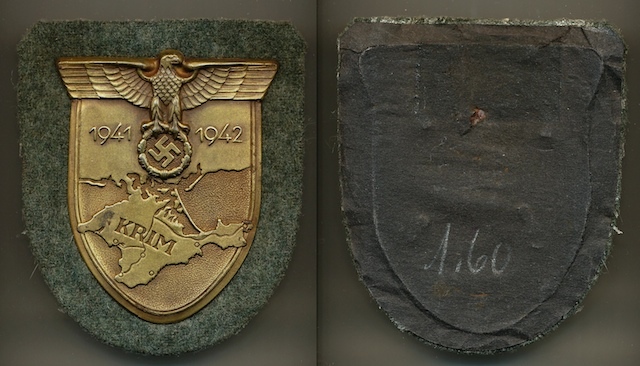 I do like to collect different campaign shields and notice there are not many threads discussing them other than the very popular Narvik thread in the Kriegsmarine forum. Are they of interest to anyone else here? Great collection Tim! Do you have any others? Yes, I have several; these are just a sample of the different type shields I have. Hi Tim....nice to see you over here. There are a few shield collectors over here. Yes, I was beginning to think there might be virtually no action on this one. You know where the brains are on this subject, just wanted to see if there were any fresh minds/thoughts over here that might add to the knowledge base. I'm getting ready to delve into the Kuban and Demjansk more after I pay off some other items. Still need a couple Krims, but they are specific ones I am looking for and you know the condition I like. Pretty much got what I am going to get in that area. The Maedicke was a good recent one for me; terrific condition! Yes, Shields are some of my favorite collections. Good to see you Tim and Peter. Nice start! 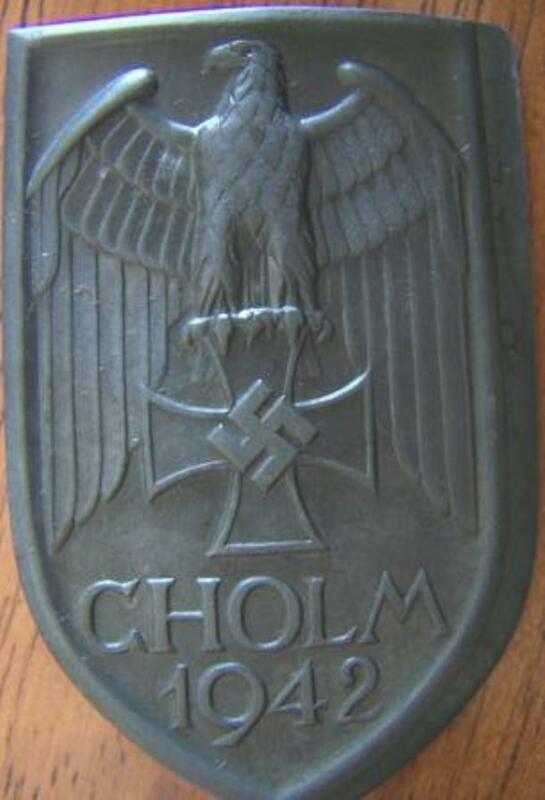 I missed my chance at a mint Cholm a few years back that Carsten Baldes had offered me; it was $900, complete with backing and all--MINT!! I said, too expensive for me, especially for a "shield". Forgot what I got instead, but I'm sure it was worth it. I don't have all my shields in one PIC, so you'll have to settle for just some of my Krims for now. Yes, you probably seen those "over there" in a larger format, but I haven't taken anymore PICS recently. Nice unknown maker you show; wish those were still 1,60 RM! I do believe I have seen your threads on another well known forum. 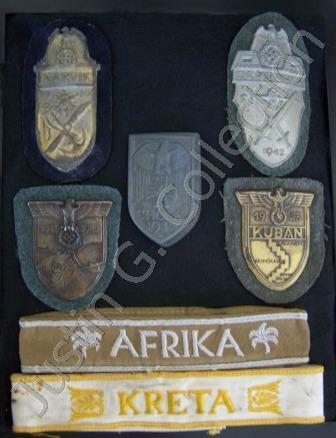 Like most collectors I have a couple of shields, Demjansk, Kuban, Narvik and 4 Krims with the various coloured backing cloths (Luftwaffe, Heer, Kriegsmarine and Panzer) but I like to dabble in just about everything so I dont specialise. Nice display of Krims you have there. we are not a forum where mentioning another forums name is taboo. Like anywhere else, blatant member fishing is seen as rude, but GMIC has a live and let live policy when it comes to other forums. Well said Chris....I use all the major forums in equal measure and tend to rate them all. Phil, how about posting those shield's up. Would like to see the KM and Panzer backed shield especially. Yes, I would agree that this should be the way but, there are those over here that do not like WAF called out at all, so I just avoid the issue all together. Merry Christmas guys! Need a Christmas icon! Boy I seem to have said something that has got a few feathers a trifle ruffled. My comment about reading some of Tim's threads on Wehrmacht Awards Forum was only meant as I indeed put it. 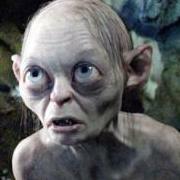 "I have seen your threads on another well known forum". There was no underlying meaning in this at all as I do indeed sometimes scroll through threads on WAF as I do with this forum. In fact Tim actually responded to a thread concerning a Panzer backed Krim I purchased and was not 100% with on WAF a few months ago. In response to the question re showing my Krims I will do just that but will have to rely on my scanner which is not an Epsom (sorry Rick). Ok here we go here are the pics of my four Krims on Luftwaffe,Kriegsmarine, Panzer and Heer backing cloths. Unfortunatly my scans are not the best due to the fact the shields dont sit flat on the screen so the images are a bit soft but I am sure you can see them. Mine surely weren't ruffled at all. I think those that feel the way they do are not actually participating in this specific thread. I got an earful sometime back when I linked one of my threads (different sub-forum) to one over there in hopes of finding out more information and ... Anyway, its all good IMO. On the Panzer shield you said might be questionable, which one is it? Upper left?? I would need to go back and review that thread. There are copies of original shields that look very good, however the details are a lot flatter than originals. Anyway, post that one here and we'll take another look. Peter and Chris are very knowledgeable on shields as well; never hurts to get more looks on an item. Phil, as Tim has said, no feathers ruffled here either. 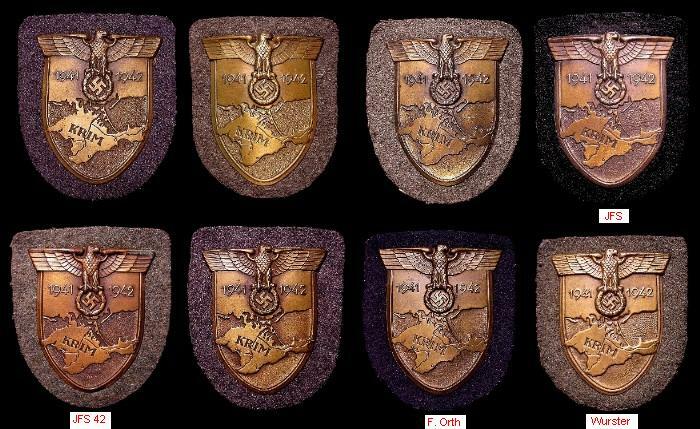 Thanks for posting the shield's...I hate to say it but the panzer backed shield top left looks like a Floch copy and the shield bottom right although original, looks to have post war cloth and backing paper. The other two are good originals in every way. 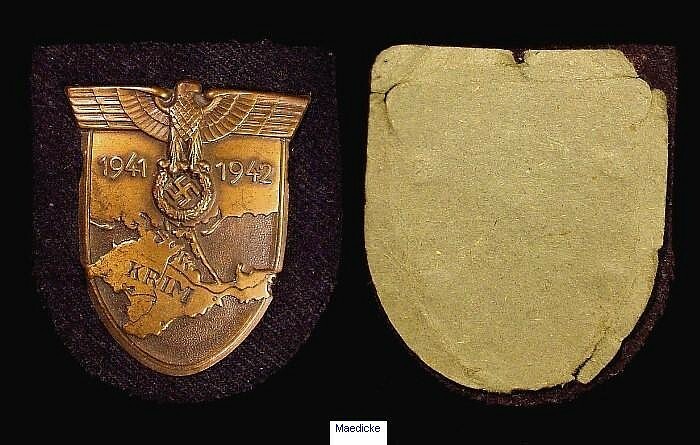 The Shield on the top left is the KM backed and the Panzer is the bottom right. 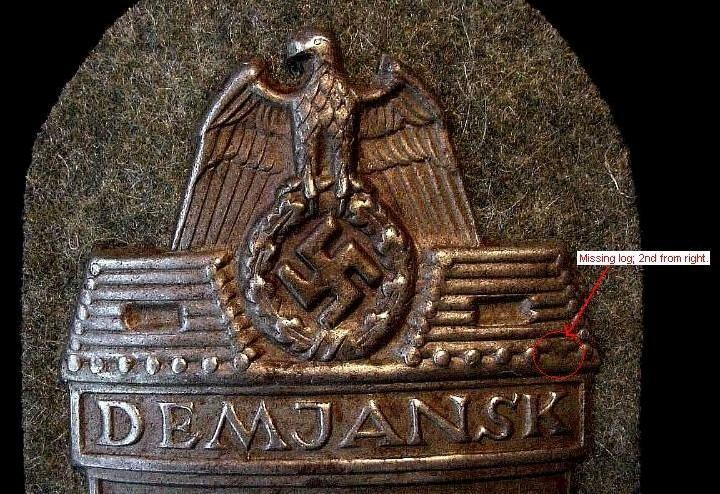 The Panzer shield has been looked at on WAF and yes no one can say for sure that it is genuine backing cloth and paper although the shield is genuine. I am going to stick my neck out here and say that I purchased the Panzer shield from Kai Winkler and the KM backed shield from Martin Bowers of M& T Militaria. Whether this may or may not have any bearing remains to be seen. First off I am happy with both shields even though I saw a ridiculous statement on WAF saying that Winkler was well known for putting different backing cloths on shields. Maybe he does maybe he doesnt but unless you have seen him do it or heard him say it then I do believe that to be a ridiculous statement to make. Peter could you post a picture of this Floch copy so I can have a good look at it. Gentlemen, we all know there are fakes out there but I am a firm believer it is not as bad as we are lead to believe and if well known and long established dealers are now putting repro cloths on the back of genuine shields just to make a 100 bucks then I think we should all give it away and collect empty scotch bottles. I have found that no matter what you have you will never please everyone...there will always be someone out there who puts doubt in your mind. Maybe they are just trying to be helpful or maybe they are not...I simply give up and if I like it then I will collect it and no I am not rich, far from it but I have been collecting for a long time and I can say I am far from being any sort of expert but I have learnt to rely on my own judgement in the end even though I do on occasions seek opinions for forums. Just remember even the experts get it wrong sometimes so I say go with your own gut feeling. Well if there was a humble pie icon available then now would be the time to use it. Peter and Tim please excuse my previous posting as Peter you are correct in the KM backed shield top left. My wife just got me Sacha Webers book (in german which i cannot decipher but she meant well) and low and behold there is that shield on the last page of the repros..... ... Damn I was so sure that shield was ok as it feels right and even the backing plate which can be seen under the paper which is lifting has rust all over it. I originally questioned the Panzer shield because it just looked too new. I will hang onto that one even though I will never be 100% sure the backing is genuine or not but the KM shield is going back for a refund I hope. No worries, Peter and I are used to hearing differing opinions and you're correct, we don't have all the answers. Keep in mind that we have been collecting these shields for awhile and after a bit, you get used to what to look for and what to look out for. On the Krim shields, yes I thought the upper left shield might be the one in question as the details are flat compared to originals; assume you can tell the differences now. I could not tell the backing color with your scans, so the one with the flat details (upper left) is the copy of the original style. The one on the lower right gets questionable as these specific shields normally are seen with either a lime green or black paper backing. As your shield has an off-white/light tan color backing, many will question it. It has been seen that some of these backings are actually the inside of old period books that had the cover's inside backing removed, cut to size and then glued to the back of the shields. As you get more of these in your collection, you'll notice some makers use a specific type of backing consistently. - The Kuban is good; a known original but the maker is unknown. - The Demjansk may be good; is it a "missing log" version? I can't quite make it out in your PIC's. I'll post one of mine at the bottom for comparison. - The Narvik is a known copy. You'll get it, don't get discouraged. As I said sorry about the scans and I must try to take good shots with my camera see what happens but yes the Demjansk is the missing log one so Yahoo I got one right. I tell you before looking at this thread I thought I had 6 good shields and one questionable but only in regards to the backing. 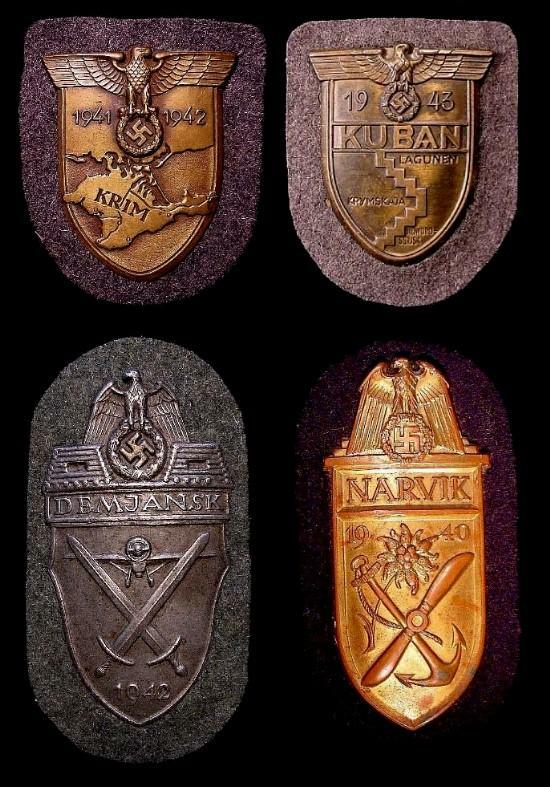 Now I have two that are no good at all (are you sure about the Narvik)...In regards to the Panzer Krim you guys are probably correct in the origins of the backing but as said, the shield is ok so I will hang onto that one. Yes I can now tell the difference between that fake Krim and the others. Not only are the features flat the shield is somewhat smaller which I didnt notice before. On the positive side today I have learnt something and will never fall for that again. Apart from Webers book on the Krim are there other reference works on the shields available? Once again many thanks to you both and Tim I am going to send you a PM seeking opinions. No worries and please let Peter confirm my thoughts on the Narvik 1st. PM sent on the Kuban and IMO, it's a good one.